Think of a time in your life when you felt worthless like nobody cared whether or not you were taken care of both emotionally and physically. Only then can you begin to empathize with a small pup by the name of Ripples, who languish behind in the high kill Carson Animal Shelter, praying for a miracle. Ripples, a small, young, energetic pup who was known to be charming, loving pup who greeted shelter patrons with a paw, is just a shadow of the dog he used to be. According to shelter staff, he spends most of his days curled up in a ball of sadness, too depressed to lift his head his head up anymore. Sad indeed. RIPPLES came in as a stray and he will need help if his family doesn't come for him. Please SHARE, he's SO sad he needs a FOSTER or ADOPTER NOW. Thanks! 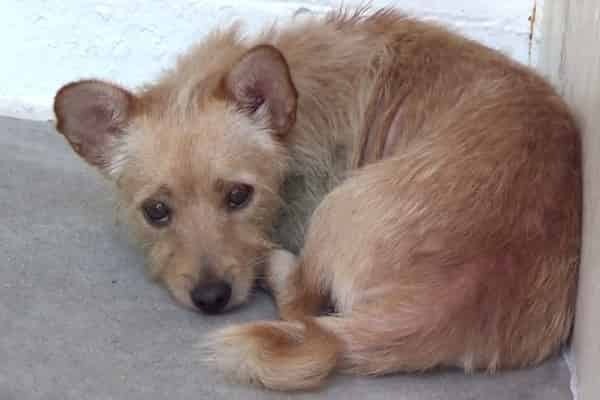 #A5115296 My name is RIPPLES and I'm an approximately 3 year old male Terrier. I am neutered. I will be available on 9/30. You can visit me at my temporary home at C215. 2 Responses to "Stray pup dumped to shelter after his family didn’t want him anymore, is just too sad to lift his head anymore"
Kind of misleading, how can a "stray" be dumped by it's family? This little guy is cute, he should be snapped up into private fostering so he can settle while awaiting a real family who will care for him ever after. Just got off the phone with the Carson Shelter and Ripples has been rescued!!! Thank you so much for sharing his story!